Did you hear that sound? One giant whooooosh as we all collapse in a heap now that the Minnesota Fringe Festival is done (not to mention all the other directors, actors, staff and volunteers involved all over the city also collapsing). This was the first time our family got an inside view of what it takes to create and perform in a Fringe play, thanks to my husband, Bob. A few years ago, Bob started talking about an idea he had — he wanted to create a performance where a diverse bunch of actors would learn all the lines to all the roles of some classic scenes, and then they would be cast randomly into those roles at the start of the play. He talked about this off and on for quite awhile, and then this year, he put his name in for the Fringe Lottery. “It takes some people years to get picked to do a show,” he said. “I might as well start now.” So of course, he was randomly selected on his first attempt! When he found out last spring, he started working on writing his script. He thought about casting and asked actors he knew to be in his show. He had to learn how to put on a Fringe play, some through talking to others and reading materials sent by the organization, but mostly by trial and error. Slowly at first, and then more emphatically as the weeks passed, the play began eating up a lot of his spare time outside of work. He began rehearsals with the actors, learned to make a promotional video (below) with Imovie, figured out and found props, edited the script several times, made advertising postcards, then more rehearsals, rehearsals, rehearsals. He called the play Principia Discordia, which translates to “The Principles of Chaos.” The plot involves the Muse Thalia wanting to direct Fringe plays, and Eris, the Goddess of Chaos, messes things up by casting a spell to mix up the roles and actors in the plays by having them chosen randomly for parts. She threatens to mix up the entire Minnesota Fringe Fest (and more) if the actors can’t prove themselves to her with their acting. The four actors have to play parts to scenes from A Midsummer Night’s Dream, Cyrano de Bergerac, and The Importance of Being Earnest. You could call this experimental theatre. The actors were nervous but willing to try; learning all the lines and roles was a difficult challenge. Everyone was behind the themes the play was exploring– typecasting, exclusion, believability and empowerment. 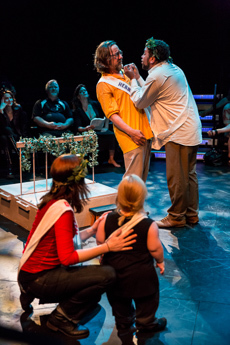 The cast was diverse with differences in gender, race, age, height and physical ability (one actor is 2 1/2 feet tall, which made the Midsummer scene interesting, with Shakespearian slurs being thrown about being a dwarf, low and little– somtimes she had to say those lines to others, other times she had them said to her). Then, in the spirit of Chaos, a week before the first performance, one of the actors had to leave the play. Bob was frantically searching for an actor when it occurred to him that HE was the best candidate. He wrote the play, knew all the blocking and the inside-outs of it. He didn’t have lines memorized, but he had, gulp, a week to do that. This kicked everything up a notch to crazy around our house. Our family was trying to do everything we could to support him– helping read lines, babysitting an actor’s child, creating the programs, helping make and distribute postcards, promoting the play, helping with props and odd errands. Our home schedules were off, we were eating on the run, and there was nervous energy everywhere. The first performance came, and it all turned out great. The concept of randomly casting actors turned out well, and as the week went on, each performance was unique (although one actress played Cyrano three times in a row, which became and inside joke). I saw all 5 performances– I hadn’t intended to, but I was asked to video record several of the shows, so I did. It was fun to see the differences in each one. The week of performances meant more rehearsals, performing, then attending Fringe after-parties and trying to see other shows too. All in all, it was a wild and crazy time, watching this play go from idea to reality. It was really inspiring to see the creativity and work my husband and others put into this show. I have a new sense of awe and respect for all the directors, actors and support people in the Fringe Festival community. It takes a lot to put on a play! Despite working a full time job, Bob took one little step and then another, moving forward to make his vision come to life. It was a big task, but he did it. This is a great example for me, who can get overwhelmed by big tasks, and great for our kids to see. I’m proud of him, and I’m glad he did it, even though it through us all into chaos for awhile. Congrats to Bob and his actors on a job well done! Huzzah! 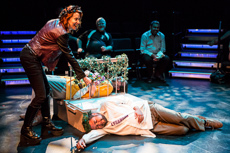 Some end notes: The play got a review in the Vita.Mn newspaper. Click here to read it. It was also mentioned in this clip here. Bob says he based the idea of his charcters Muse Thalia and Goddess Eris on writings by science fiction author Kelly McCullough. He mentioned this to Kelly, who ended up driving in from Wisconsin to see the play, commenting that it was probably a once-in-a-lifetime chance to see his characters come to life in a play. He wrote about seeing the play in his blog. And here you can watch the very-short promotional video for the show.